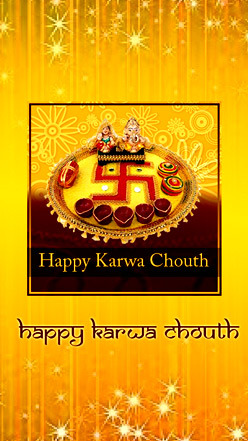 Karwa Chauth is a fast observed by married Hindu women for long life of their husband. 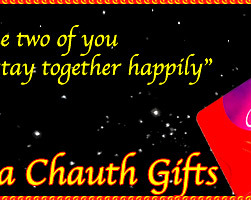 Find out a wide range of gifts to send to your loved ones on Karwa Chauth. 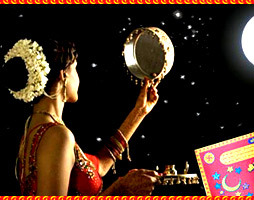 Karwa Chauth is an annual ritual observed by married Hindu women seeking blessings for long life of their husband. 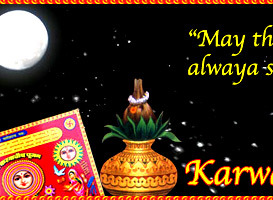 The day falls on the fourth day of Kartik month in Hindu calendar, just nine days before Diwali celebration. The institution of marriage is considered very sacred by Hindu tradition. According to Hindu tradition, the marriage of man and woman extends not only to this birth but also for successive seven lives. On Karwa Chauth day, married/committed Hindu and Sikh women observe fast and perform pooja for the well being of their husbands. They pray to Goddess Gauri to grant long life for their husbands. The tradition of observing fast for one's husband finds mention in the Hindu Epic Mahabharata, the tale of queen Veervati, the legend of Karva and tale of Satyavan and Savitri. It is believed that devotion of woman has immense power that she can even change the destiny. It is for these reasons that Karwa Chauth is regarded as very significant day for married Hindu women. Before the festival, women buy new karwas (earthen pots). They place ribbons, bangles and sweets in the karwa. Married women pay visits to each other home and exchange karwas and gifts. 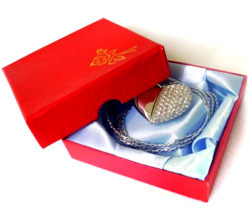 Parents also offer gifts to their married daughters on this day.